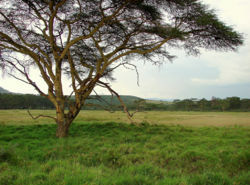 Acacia are any of the species of trees and shrubs that belong to the taxonomic genus Acacia. There are over 1,300 species with over 950 found in Australia, and others found in the Americas, Africa, and Asia. They are called Acacia's because of the Greek word for thorn, Acanth-, because a lot of Acacia's have spiny, sharp parts. Acacia is the largest genus of vascular plants in Australia , and Australia's national floral emblem is the Golden Wattle. Australia also celebrates Wattle Day every September, September 1st. 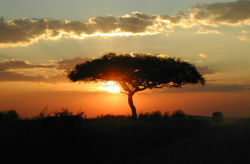 The Acacia was discovered in 1773 by Carolus Linnaeus. They sometimes form symbiotic relationships with ants, wherein they protect them within their spines and hollowed out areas, and the ants feed off of the sap. The ants in turn trim back competing plants. This page was last modified on 10 January 2011, at 17:44.